They see plants; I see books. - "Write now is good." 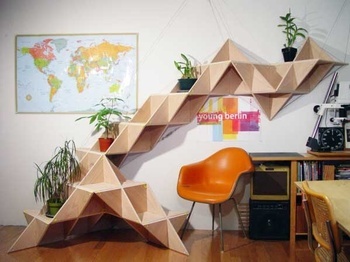 I love that bookshelf. My little ones could sit on the bottom, and not touch anything on top! Writer Dad — LOL! Good plan. Luc/mindblob — They really do look like Roger's Ball of Whack! Now I see it, and let me know what he says! Ha! Now that's a clever looking piece :-p If you ask me, it's good to liven things up with a little style (something different; ya know?). Ricardo — Yes, style is good. It adds that little extra something interesting to a space or a page or a Web site. Glad you enjoyed it!